The BPM Resource Centre has some pretty good tutorials for getting started with BPMN. For those who really want to produce top quality BMPN diagrams, I highly recommend BPMN Method and Style by Bruce Silver . Don’t be put off by the second part of th.. Fly to Mars, for free! Whether it’s wishful thinking on a large-scale, or a serious effort to colonise the red planet, the Mars One project is certainly a case of dreaming big and then trying to turn that dream into a reality. The catch is that there’s..
Enterprise Architecture is still something of a mystical term for many people. Yes, we all know it’s important but perhaps without full understanding exactly what it is. 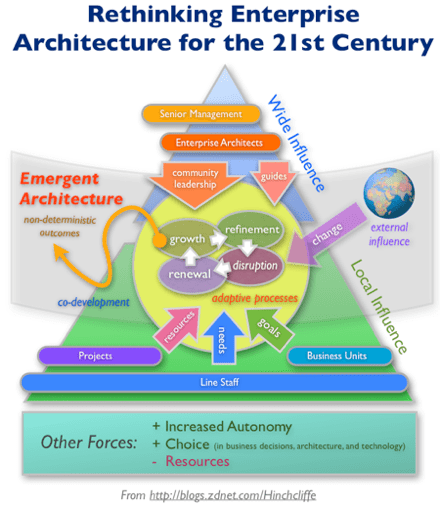 Generally one of the best ways to learn about Enterprise Architecture has been .. I sometimes struggle to keep up with the latest on cloud computing. The technology industry tends to move and change quite quickly and it is important to keep abreast of news and trends. But there is just so much information availa..
You might be familiar with mobile phone bill shock. This is when you travel overseas, turn on your mobile phone data service for a few minutes, and then return to find a bill for hundreds, or even thousands of dollars. But bill shock is not just li.. Cloud zombies are real and wreaking havoc on unsuspecting victims. Most people think that zombies only exist in the movies, but they’re wrong. Zombies are very real. They live in the cloud and are known as cloud zombies. And if you’re using any cloud s..
Microsoft and Lotus out. Google in. Cloud strategy at Reed.co.uk. Interesting article about how Reed.co.uk decided on Google Apps over Microsoft Office 365 for their cloud SaaS platform. It’s also interesting to note their reasons for moving away from Lotus technology. I’ve been informed that there is a CAPTCHA issue with posting comments. This obviously slipped through the net when I resurrected this blog. It should be resolved now. It appears that the problem was caused by an incompatibility between the WordPress..